Why Were CIA Interrogation Tapes Destroyed? 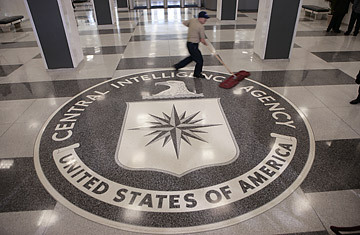 The logo of the U.S. Central Intelligence Agency is swept clean in the lobby of the CIA headquarters in Langley, Virginia. The case of the missing 92 CIA interrogation tapes would be a good subject for a modern day Agatha Christie mystery. Someone at the CIA decided the tapes had to be destroyed  even at the risk of an obstruction of justice charge  but no one's confessing. By now John Durham, the assistant U.S. attorney investigating the tapes' destruction, must be scratching his head wondering if everyone at the CIA was complicit. What we know to be fact is that in 2005, the then-head of the CIA's clandestine service, Jose Rodriguez, ordered the destruction of 92 videotapes of the interrogation in Thailand of two al-Qaeda suspects. The tapes were then destroyed, but that's where the trail ends. We can only guess whether Rodriguez acted on his own authority or on the orders of a higher-up. And then there's the question of why the tapes were destroyed. Did the CIA want to destroy graphic evidence of sleep-deprivation or waterboarding? They were interrogation methods approved by the Department of Justice in memos sent to the CIA, and therefore shouldn't have been deemed a legal problem. The closest thing we come to answer is an internal CIA e-mail released last Thursday, in which an unidentified CIA officer writes that Rodriguez decided to destroy the tapes because they made the CIA "look horrible; it would be devastating to us." But was Rodriguez acting on his own, or following orders? Rodriguez's lawyer said his client had cleared the decision up and down the CIA's chain of command, even notifying Congress. The CIA director at the time, Porter Goss, denies it, saying he never approved the decision to destroy the tapes. But in one e-mail an unidentified CIA official writes that Goss had approved the tapes' destruction  but only after the fact. The CIA's acting General Counsel at the time, John Rizzo, also denies he knew of the decision, and says he was informed only after the tapes' destruction. What adds to the mystery is that it wasn't as if the tapes' disposal was a routine administrative matter, easily lost in the press of business. One of the internal CIA e-mails described White House counsel Harriet E. Miers as "livid" when she heard about the tapes being destroyed, especially since she'd instructed that she be consulted before any decision was made about what do with the tapes. I haven't been able to clear up the mystery either, beyond the fact that a former CIA officer aware of the details of the 2002 interrogation of the two al-Qaeda suspects told me that the tapes' images were "horrific." He believes that although the interrogations fell within the guidelines provided by the Department of Justice, if the public ever saw them, it would conclude that "enhanced interrogation" is just another name for torture. But what's really too bad is that Durham hasn't been tasked with explaining the broader mystery of why, in the first place, the CIA is even interrogating prisoners of war. The 1947 National Security Act established the CIA as a civilian spy agency, not as some Pentagon backroom where you get to do things you don't want the American people to find out about. But more to the point, the military is much better equipped to interrogate prisoners. It has its own interrogation school at Fort Huachuca, not to mention hundreds of language-qualified and experienced interrogators. It also has the Uniform Code of Military Justice to deal with interrogations that have gone bad. (Some almost inevitably do.) Unlike the CIA, military interrogators have immediate access to legal counsel. It's not an accident that military misdeeds such as those at Abu Ghraib go right to trial, while CIA investigations drag on for years  and drag down morale. See pictures of Gitmo detainees.